Best known as the masked superhero in The Spirit, Gabriel Macht stars as hotshot Manhattan attorney Harvey Specter on USA’s Suits, currently in its second season. Macht’s real-life superpower? Changing from Tom Ford into American Apparel faster than a speeding bullet. Essential Homme: Does the suit really make the man? 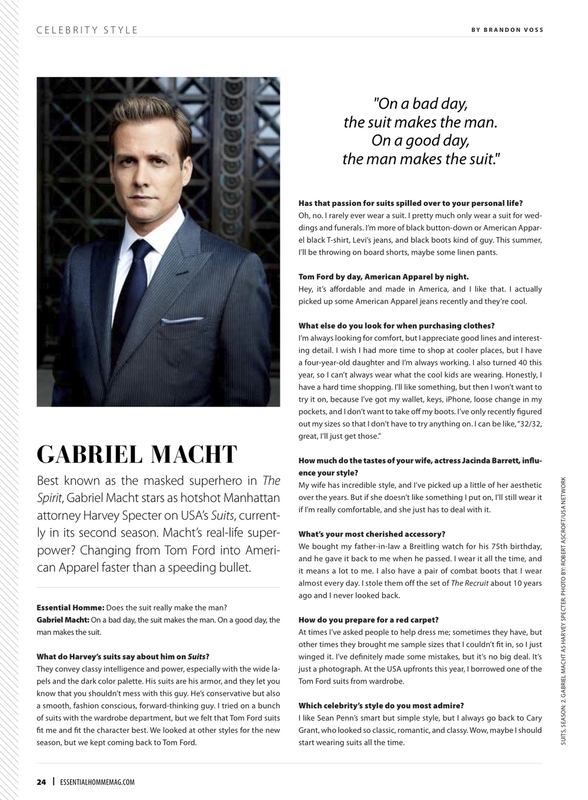 Gabriel Macht: On a bad day, the suit makes the man. On a good day, the man makes the suit. What do Harvey’s suits say about him on Suits? They convey classy intelligence and power, especially with the wide lapels and the dark color palette. His suits are his armor, and they let you know that you shouldn’t mess with this guy. He’s conservative but also a smooth, fashion conscious, forward-thinking guy. I tried on a bunch of suits with the wardrobe department, but we felt that Tom Ford suits fit me and fit the character best. We looked at other styles for the new season, but we kept coming back to Tom Ford. Has that passion for suits spilled over to your personal life? Oh, no. I rarely ever wear a suit. I pretty much only wear a suit for weddings and funerals. I’m more of black button-down or American Apparel black T-shirt, Levi’s jeans, and black boots kind of guy. This summer, I’ll be throwing on board shorts, maybe some linen pants. Tom Ford by day, American Apparel by night. Hey, it’s affordable and made in America, and I like that. I actually picked up some American Apparel jeans recently and they’re cool. What else do you look for when purchasing clothes? How much do the tastes of your wife, actress Jacinda Barrett, influence your style? My wife has incredible style, and I’ve picked up a little of her aesthetic over the years. but if she doesn’t like something I put on, I’ll still wear it if I’m really comfortable, and she just has to deal with it. What’s your most cherished accessory? We bought my father-in-law a Breitling watch for his 75th birthday, and he gave it back to me when he passed. I wear it all the time, and it means a lot to me. I also have a pair of combat boots that I wear almost every day. I stole them off the set of The Recruit about 10 years ago and I never looked back. How do you prepare for a red carpet? At times I’ve asked people to help dress me; sometimes they have, but other times they brought me sample sizes that I couldn’t fit in, so I just winged it. I’ve definitely made some mistakes, but it’s no big deal. It’s just a photograph. At the USA upfronts this year, I borrowed one of the Tom Ford suits from wardrobe. Which celebrity’s style do you most admire? I like Sean Penn’s smart but simple style, but I always go back to Cary Grant, who looked so classic, romantic, and classy. Wow, maybe I should start wearing suits all the time. Essential Homme, July/August 2012 issue.